Most visitors hear Malibu beaches and think one word: ZUMA. So we'll start our tour there. Run by Los Angeles County, Zuma Beach, is arguably the centerpiece among Malibu beaches, geographically if not culturally. With two expansive miles of well-packed sand, lifeguard stations, volleyball courts and ideal waves, it's a draw for surfers, swimmers and sun bathers. It's also usually well-packed with teens, since Malibu High School is a stone's throw across Pacific Coast Highway. Zuma has shown up in countless films and on a parade of top destination lists. Sunset magazine named Zuma one of its Top Ten Beach Strolls in its October 2007 issue. From May to October, Zuma Beach draws tens of thousands of visitors. And with good reason: easy access, plenty of parking, snack bars, volleyball courts and great surfing. Link to our page of Malibu beaches parking and directions. L.A. County runs a beach Web site listing weather and surfing conditions at all county-run beaches, including Zuma Beach. Click here for the Zuma Beach Web Cam. To the east of the main entrance to Zuma Beach, another wide, sandy stretch, Westward Beach, extends to Point Dume. Westward Beach is technically part of Zuma beach. 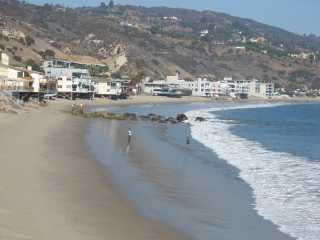 For the rest of Malibu's beaches, we'll start to the east, with Topanga Beach. Smaller than Zuma, it still offers a wide, sandy beach, swimming surfing, fishing and a picnic area. Check out the general store right across the highway. Topanga Beach along with its neighboring stretches of Pacific Coast Highway might be the best spot along the Malibu beaches to watch dolphins and whales, since this stretch of beach is narrow and the highway is somewhat higher than beach-level. Park right along the highway and get a car-side view of passing marine mammals. West of Malibu Canyon Road, catch some waves at Dan Blocker State Beach (shown in image at left) also known as Corral Beach after Corral Canyon. Surfing, scuba diving and fishing are popular here. Note that parking is free along the roadside - but limited. Farther west, visit Surfrider Beach and Malibu Beach, where Malibu Creek meets the Pacific. The area's official name can be confusing for tourists. On a map look for the name Malibu Lagoon State Beach, which incorporates both beaches. Follow the creek inland and you be in Malibu Lagoon State Park. 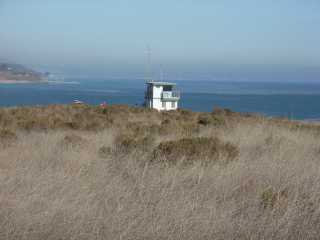 The state beach area not only includes the beaches but a saltwater marsh nature area. Be sure to visit adjacent Adamson House and Malibu Lagoon Museum. Surfrider beach got its name because of its great surfing waves. To best watch the surfing action, head just east down the road to Malibu Pier. 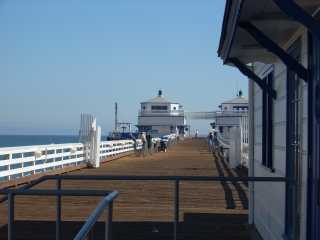 The roadhouse-style eatery and concert venue Malibu Inn is just across the highway from the Pier. Malibu Lagoon State Beach is one of 85 state parks in California offering free AT&T wireless Internet access, or Wi-Fi. Does this rock look familiar? (OK, we visited at high tide, so imagine the same scene with the tide WAY out.) Ever see the Gidget movies? Yep, that's the spot. It was also a backdrop in Letters From Iwo Jima, Pirates of the Caribbean and hundreds of other movies, TV shows and commercials. 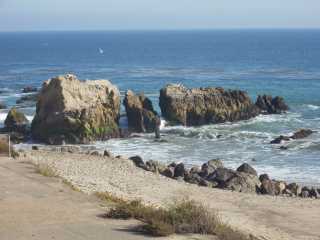 Leo Carrillo State Park is not as wide as Zuma Beach, so visitors can park just yards from the waves. That makes it perfect for kayakers, who can easily access the area's tide pools, coastal caves and reefs at Sequit Point. Close-in kelp beds make it popular for scuba divers. Leo Carrillo State Park is also one of the 85 state parks in California with free AT&T Wi-Fi access, but note: users must be within about 200 feet of the camp store to get reception. 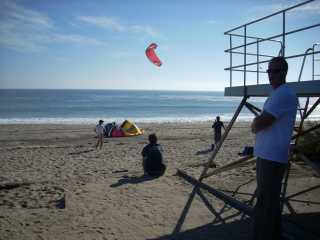 On the day we were there a kite surfing club caught some wind. Just East of Leo Carrillo State Park is Nicholas Canyon Beach, very popular with locals because it is usually less crowded (even though it features all the amenities of Zuma Beach). It's especially popular with local surfers, who refer to the waves here as "zeros," for their perfect point breaks. Body boarders love this beach as well. Be sure also to check out Malibu's pocket beaches for beautiful, secluded coves, sea caves and kelp beds. Together these are officially known as Robert H. Meyer Memorial State Beach. But if you’re traveling on PCH, look for the turn-off signs for El Pescador Beach, El Matador Beach and La Piedra Beach. Park at the top of the bluffs and take the pathways or stairs down to the beaches below. Note: Private beaches also dot this area, but El Pescador Beach, El Matador Beach and La Piedra Beach are public beaches. Leo Carrillo State Park offers 127 campsites shaded by beautiful giant sycamore trees. It's the only site among Malibu beaches that features a coin-operated laundry room and video game room and camp store. Come back soon to our Malibu Beaches page: we'll be adding more dining, activities and accommodations news. Return to our Malibu page.